Once an ‘albergaria’ providing inn-style family accommodation, a major renovation last year has turned Vitoria Stone into a chic four-star hotel just outside the historic walls of the central Portuguese town of Évora. Its low-ceilinged lobby is characterized by thick, misshapen concrete pillars, which look as if they’ve just been poured. In fact, they’re an artistic representation of the megalithic tombs scattered throughout the region. Large glazed wine amphorae standing around the floor and black and white photographs of archaeological menhirs (cromlechs) on the walls enhance the theme of ancient history. Upstairs, corridors leading to the 48 rooms exude a sense of surrealism, an effect created by a glass ceiling and dark walls along the narrow space with a large design made from cork – a tree abundant in the area – decorating every door. While not overly spacious, bedrooms are sufficient in size. Ours, in muted tones of gray and black contrasted by gleaming chrome light stands, featured a small balcony with views over the ochre-colored slate roofs of the town. Highlighting the hotel owners’ environmental preference for recycled materials, old throwaway planks of wood, newly varnished, had been transformed into a headboard, adding a surprising touch of contemporary chic. This emphasis on recycling was apparent also in the hotel spa, which was designed with the use of old, wrought iron fencing. The wash-hand basin in the ground-floor men’s bathroom resembled a stone horse trough, though I’m not sure if it was authentic or emerged from a sculptor’s imagination. Breakfast was served on the 4th floor, either alfresco on a narrow balcony framed by a variety of local herbs in small pots or indoors with large windows overlooking the old town. Furnishings are eclectic with an interesting combination of metal and lacquered wood surfaces and mirrors, metal sheets on pillars a leftover from construction, rust-colored ‘barro’ pottery, ornaments made from cork and an impressive collection of more than 70 bright blue plates hanging from the walls, all made by local, intellectually-challenged people. Above, on the 5th floor, is an open, rooftop terrace bar and a large sunbathing area with chaise lounges beside an infinity dipping pool bordered by herb boxes, with an adjoining indoor sauna and compact gym with two running machines and two exercise bicycles. The Almendra Spa is also located here, offering classic facials and massages, including a unique ‘Fado music massage.’ Using Portuguese aromatic oils, the therapist co-ordinated her movements skillfully to the soft rhythms, the overall effect being an enhanced feeling of relaxation for both body and mind. Dinner is served on the first-floor just off the lobby in the ‘5 Amêndoas’ (Five Almonds) restaurant – the five symbolizing health, longevity, fertility, prosperity and happiness. Our evening began in regal fashion with Ivo, our attentive waiter, serving my gin order in the most ceremonial of manners, crushing juniper pellets table-side and delicately slicing the grapes that he felt would best accompany the G’Vine variety, mixing in the Fever-Tree tonic to the whole before vigorously stirring with a long, silver spoon. Chef Narciso Peraltinha takes pride in reviving rich Portuguese dishes and presenting them in a contemporary manner. In texture, his traditional Alentejo dogfish soup was akin to a savory eggnog, a thick creamy broth containing two large cuts of soft flesh spiced with lemon juice and flavored with coriander (a herb often used in Portuguese cooking). The soup came in a bottle and was poured into a ceramic bowl tableside. Meats being of high quality in central Portugal due to the area’s verdant grazing grounds, we opted for traditional ‘Alentejo migas,’ and Mertolenga DOP beef stuffed with Serpa cheese for our mains. The former – a collection of pork ribs, sausages and a polenta-like mixture of bread soaked in meat juice and gravy – may not represent a low calory-count but was a delight for the palate. The latter main is healthier and no lesser in taste, consisting of two slices of local beef with melted cheese between, framed by eggplant, carrot and mushrooms. Don’t surrender before dessert, for this is just the place to try two well-known Altentejo delicacies: egg-based puddings, encharcada, served with ginger ice-cream and sericaia, with almond ice-cream. Our meal ended with an Alianca Velha, a robust Portuguese brandy, and a vintage 20-year-old Insignia port. Located just outside the walls of the old town, it is an easy stroll from Vitoria Stone to the historic center, to the town museum atop both Roman and Islamic ruins and featuring 14th century tombstone sculptures and megalithic monuments or to the impressive remains of an ancient Roman temple. 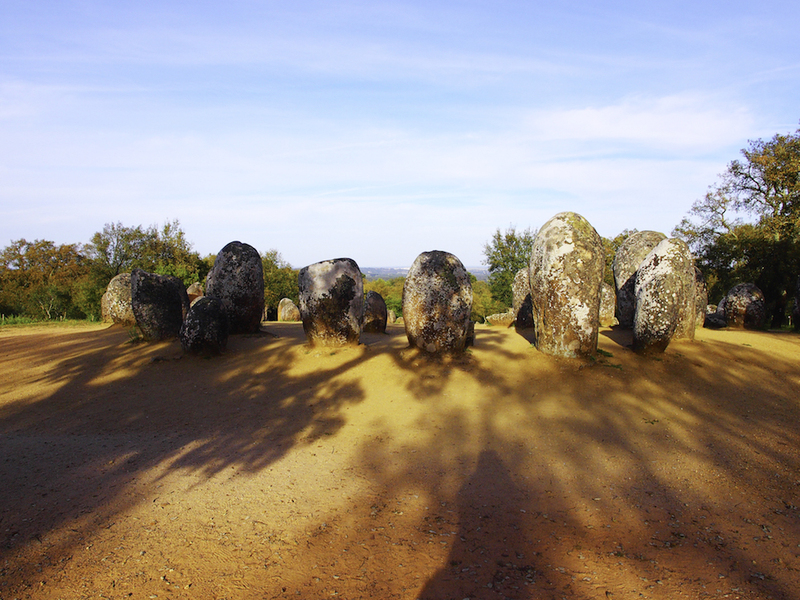 Further insight into a bygone era is provided by a visit to the megalithic landscape west of Évora, the most diverse on the Iberian peninsula. Within a small area are ten such sites with almost 100 single menhirs, 800 dolmens and some 40 megalithic villages. For something completely different, rent a car from Auto Europe and drive less than an hour to several reputable Alentejo vineyards to enjoy wine tastings and special lunches. That of well-known viticulturalist, João Ramos lies near the town of Estremoz, known as ‘the white city’ because of its marble. Having acquired land in 1990, Ramos built his first winery seven years later by renovating buildings on an old property. With 32 hectares of vineyard, including alicante bousquet and trincadiera grapes, Ramos produces around five million litres of 12 different wines annually, red, white and rose, including Pouca Roupa Rosé, the buttery Vila Santa Reserva and Marquês de Borba Tinto. The vineyard, which exports 60 per cent of production, features large marble buckets where people still crush grapes with their feet and 20,000 French oak barrels. Our lunch was a varied one consisting of chorizo and cheese starters with partridge pie with white asparagus and mushrooms as the main. The Ramos family also organize seasonal hunting parties. For an authentic Portuguese experience that combines comfort, fine wines and historical perspective away from the more touristy locations of the Algarve, Porto and Lisbon, Évora and the Vitoria Stone hotel are excellent choices. Posted in Destinations, Luxury HotelsTagged Almendra Spa, Auto Europe cars, Chef Narciso Peralthinha, Evora luxury accommodation, Fado music, gourmet restaurant in Evora, hotels in Evora, Joao Ramos wines, Portuguese food, Portuguese hotels, Portuguese wines, visit Evora, Vitoria Stone HotelBookmark the permalink.